(91outcomes.com) - Following on the heels of a presentation of new research findings by Dr. Dane Cook showing powerful objective evidence -- functional magnetic resonance imaging (fMRI) -- of dysfunction in the brains of ill veterans of the 1991 Gulf War, one of the pioneers in the field of Gulf War Illness research presented an overview of findings yesterday that both dovetailed with, and expanded on, Cook’s team’s fMRI findings. Findings by a large research team led by Dr. Robert Haley, MD, of the University of Texas Southwestern Medical Center, added further confirmation of brain dysfunction in regards to pain processing, cognitive and other functioning in the brains of ill Gulf War veterans. Using sophisticated medical research methods, including Quantitative Sensory Testing (QST) fMRI, a national survey of more than 8,000, and a week-long inpatient battery of advanced testing of nearly 100 ill Gulf War veterans, Haley’s team successfully to replicated, validated, and expanded on earlier findings that teased out the specifics of brain dysfunction in ill Gulf War veterans. Haley’s team’s findings were presented during the first morning of two days of public meetings being held this week by the Congressionally chartered Research Advisory Committee on Gulf War Veterans’ Illnesses (RAC-GWVI) at the Boston University Medical Center in Boston, Mass. In 1996, medical research findings from a UK scientist (Jamal et al) found a two-fold increase in cooling detection threshold in ill Gulf War veterans, providing some of the first objective evidence of the physiological underpinnings of Gulf War Illness. Among the first research related to Gulf War veterans led by Haley was a 1998 medical research study that replicated the 1996 UK study. This was followed by several studies that looked at possible mechanisms of sensory and pain handling in the brains of ill Gulf War veterans. All showed objective evidence -- though sometimes difficult to interpret -- of brain dysfunction. Haley’s definition of Gulf War Illness is unique. Since the 1990s, he has postulated that there are subsets within Gulf War Illness, an idea that remains controversial today in the scientific community. Syndrome 1: “Impaired Cognition,” a symptom complex characterized by inability to “remember things,” as well as profound fatigue. Syndrome 2: “Confusion-Ataxia”, a symptom complex that profoundly affects the veteran’s ability to think, comprehend, or interact. Syndrome 3: “Central Pain,” a symptom complex with chronic widespread pain as its central feature. Haley said he believes Syndrome 2 and 3 are related, and perhaps different stages of the same disorder, but that he believes Syndrome 1 is something very different from the other two. However, another of the leading GWI medical researchers argued that the symptom subsets may instead be indvidualized manifestations of the same underlying disease processes. Adding further confirmation to Cook’s team’s fMRI brain imagery related to pain processing, Haley reported that his team saw dramatically more sensitivity (hyperactivation/hyperarousal) with noxious heat pain stimuli in fMRI of Syndrome 1 and Syndrome 2 patients than in controls. However, the hyperactivation when exposed to noxious heat pain stimuli was inexplicably not present in fMRI of those labeled as Syndrome 3 (chronic pain). His team found no difference in fMRI between controls and any of his three Syndromes when exposed to innocuous warm stimulation. However, the team’s findings in fMRI of Syndromes 1 and 2, which generally have little chronic pain, they had much less brain activation when exposed to innocuous warm stimulation than either controls or Syndrome 3, which is characterized by chronic pain. Haley termed the effect in Syndrome 1 and Syndrome 2 of lower than normal pain sensitivity and brain activation to innocuous warm stimulation, but significantly higher than normal pain sensitivity and brain activation to noxious heat pain stimuli, “hypoactivity-hyperarousal” -- objective evidence of brain dysfunction in pain and other processing. Haley’s fMRI and other findings differ from other studies of Fibromyalgia (FM) patients. In FM, not only does fMRI reveal increased activation in the regions of the brain associated with pain processing when exposed to to noxious heat stimuli, but also to innocuous heat stimuli. This feeling that virtually everything is more painful than expected is known in medical terms as “allodynia”. Haley’s research data suggested that the autonomic dysfunction affected one type of brain chemical effect -- cholinergic -- than another -- adrenergic. Haley’s team’s findings found that all three Syndromes had higher scores than controls on the cholinergic symptom scales but not the adrenergic symptom scales. Using another advanced testing procedure, QSART, differences were greater in the feet, less in shins and thighs, a pattern that is typical in peripheral nerve involvement. Haley said this is suggestive that small cholinergic fibers may be dysfunctioning. 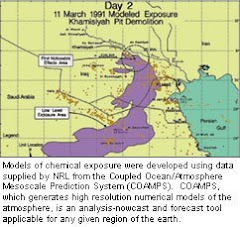 Haley has long argued that even low-level exposure to chemicals -- including organophosphate (OP) pesticides and sarin nerve agent released at the Khamisiyah ammo dump detonations by U.S. troops in southeastern Iraq in March 1991 -- are the root cause of the brain damage and resulting disease state of ill Gulf War veterans. He also stressed the need for a relatively quick diagnostic test to determine if veterans have GWI, or something else. As have other medical researchers, he noted that this is important not only for benefits purposes and peace of mind, but also for treatment purposes and potentially in the future to help validate the effectiveness of treatment. Jamal et al 1996, finding two-fol increase in cooling detection threshold during QST in British GWI GWVs. 1998 Haley study UT-S confirmed Jamal, then undertook several studies of possible mechanisms of sensory and pain handling. Haley et al 2009. Infused physostigmine, found “abnormal brain response to cholinergic challenge in chronic encephalopathy from the 1991 Gulf War”. Li et al, 2008. Hippocampal dysfunction in Gulf War veterans: investigation with ASL perfusion MRI and physostigmine challenge. Tillman G et al, 2012. Auditory stimuli in fEEG protocol. (91outcomes.com) - Cutting edge research from the University of Wisconsin-Madison is providing new pictorial evidence of marked brain dysregulation in Gulf War veterans suffering from chronic widespread musculoskeletal pain (CMP), one of the most commonly reported symptoms of Gulf War Illness. According to lead researcher Dr. Dane Cook of the University of Wisconsin-Madison and the Madison VA Hospital, his research team’s findings also suggest potential avenues for treatment aimed at “resettting” the dysregulated functioning in the brains of ill Gulf War veterans. Cook’s team’s findings, including powerful images of important brain functional differences, were presented at the opening of public meetings being held this week by the Congressionally chartered Research Advisory Committee on Gulf War Veterans’ Illnesses (RAC-GWVI) at the Boston University Medical Center in Boston, Mass. In addition to new preliminary findings, Cook presented excerpts of his team’s past research and related research on fibromyalgia (a disease characterized by chronic widespread pain). Much of Cook’s team’s work has focused on functional Magnetic Resonance Imaging (fMRI) of the brains of Gulf War veterans, including before and after exercise, and during application of painful stimuli. Cook says his data show the functioning of the brains of his principal study subjects -- Gulf War veterans who have chronic musculoskeletal pain (CMP) -- differ in important ways from healthy study subjects. For the purposes of the studies, “Chronic” was defined as long-term, with pain unrelenting for at least six months or longer; most of the study subjects have been experiencing pain for many years. The pain must also have been widespread, affecting at least three of four body quadrants, so as to rule out a localized injury where pain only affects one part of the body. 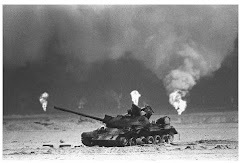 The research results show that Gulf War veterans with CMP are significantly more sensitive to heat pain than healthy Gulf War veteran controls, and fMRI images provide objective confirmation of this. And, this hypersensitivity to heat pain is magnified following exercise in the Gulf War veterans with CMP, in some cases as much as tripling. For the healthy Gulf War veterans, sensitivity to heat pain did not change relative to before and after exercise. Cook said the research findings, including detailed fMRI pictures are, “suggestive of less white matter integrity [density] in the brain,” meaning the brain is not functioning normally in the ill veterans. Cook’s research also looked at fatigue in his Gulf War veteran subjects, another major Gulf War Illness symptom. He said his team’s findings show that the greater the feelings of fatigue in the ill patients, the less the white matter integrity [density] in brain regions known to be central to pain processing. In general, Gulf War veterans with CMP show decreased brain white matter integrity (density; “lower FA and higher MD”) in several regions of the brain associated with fatigue and pain processing. Cook said these objective brain imaging and correlated findings are suggestive of altered communication along spinal tracts that are involved in pain processing and pain modulation. And, his team’s research hopes to show whether Gulf War veterans are similar to fibromyalgia patients in another area, too. Research shows that FM patients who are more sedentary -- those who sit for at least 60 minutes at a time during their daily lives, as measured during extended testing -- exhibited more pain processing dysregulation in the brain. Whether this sedentary behavior is a symptom or -- or is part of the cause of FM's worsened pain symptoms -- remains unclear. However, Cook expressed hope that additional research related to exercise therapies should help resolve this question. Cook suggested that areas for future treatment exploration might include, “anything that might help reset a dysregulated [pain regulation] system” in the brain and central nervous system, including brain stimulation methods. (91outcomes.com) - A new medical journal article reports that Gulf War and other veterans age 55 and younger are almost three times more likely to report urinary incontinence than their civilian counterparts. [Urinary] Urgency was the most common problem, reported by 15% of veterans and 8% of civilians. The rates of stress and mixed incontinence were 4% and 2%, respectively. Moderate to severe symptoms also were more common among the veterans (19% vs. 3%), whereas 1% of each group reported severe incontinence. However, Dr. Markland said, when the group was broken down by age, the youngest group was driving the difference. Men aged 55 years and younger were three times more likely to report any urinary incontinence than were the nonmilitary population. The difference remained significant even after investigators controlled for ethnicity, socioeconomic level, body mass index, diabetes, and heart disease. Dr. Markland is an internal medicine doctor at the Birmingham, Ala. VA Medical Center. She says that, "there’s no way to tease out any cause and effect information."